While I had often thought about what makes content effective, I had never thought about the difference between good content and effective content in that way. Marketers, like me, are creating good content every day but how are we really determining if it is effective or not? And could our results improve as dramatically as the difference between a lightning bug and lightning if we were more deliberate with each piece? Many small-mid size businesses have limited marketing resources. It isn’t unusual to have a marketing team of one or two or sometimes none at all. That said, most organizations now recognize the importance of content and have some type of strategy in place. The strategy may be very well defined or it can be something as simple as create one new piece every two weeks. Whatever the strategy is, it can be easy for a marketing team of one or two to fall into a “just get it done” mentality. Approaching content creation as something to just check off the list is what leads to lightning bugs instead of lightning. In order for content to be effective it has to have context. It needs to align with your prospect’s buyer’s journey. More specifically, with the journey each of your buyer personas take as they navigate their way through purchasing the product or service your organization offers. Hopefully, your content strategy does include a unique strategy for each of your personas. If it doesn’t, it should. And if you haven’t defined your buyer personas yet, you really need to. Without them, you cannot possibly create effective content. Epiphany – During this phase, the prospect realizes they have an issue or that they need to change something. Awareness – The prospect begins to research and understand their problem and possible solutions. Consideration – Solutions are considered. A short list is determined. Decision – The prospect decides on the solution that will work best for them. At every phase of the journey, the prospect is seeking different types of information that will help them move forward. It is important that you offer it and that they can find it. Here’s a quick list that shows the different types of content that work/fit with each phase of the journey. Some types of content work throughout the journey. Epiphany and Awareness – The key in both of these phases is to provide content that educates. It can include ebooks, whitepapers, how-to guides, blog posts, tip sheets, infographics and video. Consideration – When a prospect reaches this phase, they know they have a problem or issue and are trying to figure out the best approach to solving it. Content types that work here include case studies, more in depth whitepapers and ebooks, video testimonials, ROI calculators, webinars, assessments and data sheets. Decision – Your prospect is now ready to make a decision. It is time to supply them with vendor/product comparisons, pricing guides, free trials, product demos and more testimonials and case studies. When you think about content in terms of the buyer’s journey, it really makes it clear just how much content is needed. If you have multiple buyer personas, then you have even more content to create and track. The goal of creating effective content can almost seem out of reach or at a minimum, overwhelming. 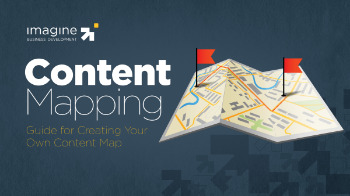 A tool that we use at Imagine is a content map. The term content map means different things to different people but to us it is simply something to help us track the content we have and/or need to keep our personas moving through the buyer’s journey. The tool itself is an Excel spreadsheet with columns for buyer persona, type of content, phase of the buyer’s journey, title of the content, URL for the content and notes. It is easily sortable and allows us to see very quickly where we need to focus our content creation efforts. Because we have found this tool so helpful, we have decided to share it with our readers. Just click on the call to action at the end of this post to download your own copy. Feel free to modify it to make it work for you. By adding a few columns, you could also use it to track progress and assignments for new content. Like lightning bugs, good content is fun to create. But harnessing the power of lightning with content that provides context has rewards that go well beyond having fun.